Durban; South Africa, July 4, 2018: Tourism KwaZulu-Natal, partnering with the KZN Travel and Adventure Show, which will exhibit alongside the ECR House and Garden show, will be supporting 15 Small, Medium, Micro Enterprises (SMMEs) tour operators and accommodation establishments to showcase their businesses to almost 10 000 consumers from July 5 to 8 at the Durban Exhibition Centre. In the coming days tourists with a flair for lifestyle tourism will mingle with tour operators, travel agents and the general public to be inspired to plan their next holiday/get-away or wedding in the Zulu Kingdom. 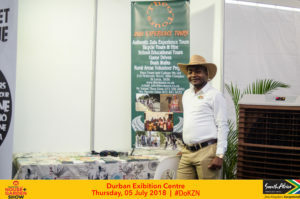 “Whether you enjoy four-wheel driving adventures, ice skating, rock climbing, sea cruises, visiting historic battlefields or experiencing Zulu culture or KwaZulu-Natal’s diverse heritage, the Travel and Adventure Show is the place to be,” said Phindile Makwakwa, acting Chief Executive Officer for Tourism KZN. Makwakwa said the show was a platform for the province to exhibit its unique tourism experiences to the people of KZN Makwakwa pointed out that this year’s KwaZulu-Natal Travel and Adventure show would see 15 SMME’s, under the Tourism KwaZulu-Natal (TKZN) Enterprise Development and Incubation Programme exhibit their accommodation establishments at the four-day exhibition. 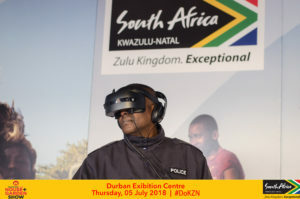 TKZN will also be doing a virtual reality “Do KZN” activation that will run the full duration of the House & Garden Show giving visitors a feel of KZN’s experiences with the focus on adventure activities. There will be daily promotions and activities at the Show and guest appearances by the Sharks rugby team as well as Wild Adventures Jungle Playground for children plus dancers and a poet forming part of the KZN Department of Arts and Culture stand. Makwakwa said the Incubation Programme has guided dozens of emerging business to success over the years and generated immense interest amongst up and coming tourism entrepreneurs. She said up-and-coming B&B and guest house owners, tour operators and travel agents and owners of tourism attractions were being skilled and developed. “Our focus includes market support enabling owners to take part in trade and consumer shows like the Africa’s Travel Indaba and The Travel and Adventure Show here they can interact directly with consumers ready to buy their next holiday package,” said Makwakwa. One of the TKZN SMME Development and Incubation Programme participants is Nomonde Buthelezi (37), the CEO of Romaflo Travel established in 2016. Buthelezi said she wanted to give customers the best travel experiences and value for their money. Buthelezi has been part of the incubation programme since May 2018 and said she got her “big break” at Africa’s Travel INDABA this year. The INDABA is staged annually in Durban and Africa’s biggest tourism exhibition, but is only open to the tourism trade industry. “It (the INDABA) created opportunities to market my business on a large platform and interact with international and local byers,” said Buthelezi. The public will be able to interact with more than eighty tourism destinations, resorts, operators and airlines, offering significant discounts and show specials for novel travel and adventure activities – all under one roof. A ticket to the ECR House and Garden Show allows free entry to the KZN Travel and Adventure Show. 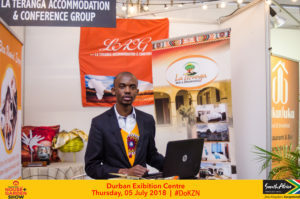 “This is an iconic flagship consumer show to promote travel within the province and for the people of KZN to explore and discover new tourism products including hidden gems ranging from the magnificent Drakensberg to the adventure-filled South Coast and historical sites like the Mandela Capture Site and Inanda Heritage Routes,” said Makwakwa. She added that there was a great demand for a show like these because people would be able to shop around and come face to face with the tour operators, etc, whom they would deal with. Some 90 000 people are expected to attend the show and exhibitors range from travel agents, caravan and camping, holiday destinations, arts and crafts and many more. Tourism KwaZulu-Natal was established in 1996 and is responsible for the development, promotion and marketing of tourism into and within the province, both domestically and internationally. The organisation is an entity that reports to the provincial Department of Economic Development, Tourism and Environmental Affairs. The KZN Travel & Adventure Show provides an opportunity to promote intra-travel within the province and for the people of KZN to explore and discover new tourism products that they can visit on their next holiday. The show places you in front of the wide array of exciting options open for both local and international travel with great show specials and competition. Exhibiting will be 80 suppliers with inspiring places to go, things to do and people to meet amazing holiday specials, competitions, tips, information and more. MEMBER OF THE PUBLIC ENJOYING THE VIRTUAL GOGGLES EXPERIENCE, OF THE KZN TOURISM DESTINATION ACTIVITIES THEY HAVE TO OFFER. 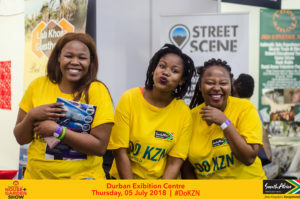 ABOVE: SOME OF THE TKZN #DOKZN PROMOTERS ENJOYING THE EXPERIENCE IN THE TRAVEL AND ADVENTURE SHOW EXHIBITION. Nomonde Buthelezi (37) is the CEO of Romaflo Travel which started in 2016 and begun fully operating in February 2018. Romaflo Travel is part of the TKZN SMME Enterprise Development Incubation Programme which was established to assist local tourism businesses thrive in the tourism sector. The Newcastle-based travel agency was established by Buthelezi because she wanted to give customers the best travel experience and satisfaction for their money. The agencies services include but are not limited to: travel packages, car rentals, accommodation, cruises, flight bookings, shuttle services, travel insurance and visa services to name a few. “I wanted to give customers the satisfaction they looking for in my business and because I love interacting with people,” said Buthelezi. Speaking about her participation in the Incubation programme she added it has provided her business a platform to showcase its potential. “I have been part of the incubation programme since May 2018. It has been a stepping stone for my business to showcase its potential. Through the programme this year I managed to get my big break exhibiting at Africa’s Travel Indaba. “It created opportunities for me to market my business on a bigger platform. Through this I had the opportunity to interact with international buyers and local byers, including other SMME’s who are part of the programme,” said Buthelezi. The name of the business ‘Romaflo’ is derived from Buthelezi’s mother and father’s name – Romanus and Florencia -who helped set up the company. Leisure Holidays Travel and Tours is run by 39-year-old- Mbali Mbonambi. The travel agency was established in 2010 but only started fully operating in 2017. The agency focuses mainly on outbound travel but does also cater for inbound customers. Leisure Holidays joined the TKZN SMME Enterprise Development Incubation Programme this year. The programme was established to assist local tourism businesses on their journey to success. The agency offers the following services accommodation bookings, luxury cruises, weekend getaways, holiday tour packages and others. Mbonambi, who was bitten by the travel bug at a young age, said she established her agency because she was passionate about travelling and wanted people to experience the same feeling she did when she travelled around different continents. “I want to share that experience of travel. I have been to Zambia, Zimbabwe, Mozambique, the United Kingdom, Spain, and Ireland,” said Mbonambi. Speaking about her participation in the Incubation programme, she said it has provided her business with a platform to showcase what it has to offer to international and local buyers. “The programme has been of great help to my business. Through the programme I am learning how to package my business the right way and learn about running a successful business. It has also given my business exposure and opened up opportunities for me,” she said. Before establishing Leisure Holidays Travel and Tours – Mbonambi headed up Intantokazi Tours in KZN. Amamboma Travel and Tours was established by Mandla Sikhakhane (49) and has been operating for eight years. The agency is based in the Durban CBD. Amamboma Travel has been part of the TKZN SMME Enterprise Development Incubation Programme. Amamboma Travel and Tours is part of the TKZN SMME Enterprise Development Incubation Programme which was established to assist local business to achieve success. Sikhakhane said his business was inspired by his passion and interest in the tourism sector. “The motive and inspiration behind the business was my immense love for travel and interest in the tourism industry,” said Sikhakane. The agency services include but are not limited to: township tours, golf tourism, travel packages, city tours. Before starting his own business, Sikhakhane was a business development manager in the marketing department at Toyota in 2012. Street Scene is the brain child of Sthembiso Mbonambi (44). The tour company is based in 39 station Drive, 4th Floor, The Design Factory, Durban. Street Scene is part of the TKZN SMME Enterprise Development Incubation Programme and has been for the past two years. Street Scene is a Tour and Events company that provides a platform for visitors and showcases Durban and the surrounding countryside. The company was established in 2009 but only started fully operating in 2010. “We started fully operating in 2010 and the 2010 World Cup was a platform for us to showcase what we can bring and offer the people from the different continents. We call ourselves an alternative tour because we do something that you don’t see on television or read about. “We are here to showcase the hidden gems of this country. We all about telling the story of where we coming from, who we are and we connect with people,” said Mbonambi. “It has given my business good exposure. I’ve travelled to Rome to sell my product to international buyers. I was also fortunate to showcase what my business has to offer at the 2018 Africa’s Travel Indaba. This has given me the opportunity to interact with international and local buyers,” he added. Lala Khona is a cosy Bed and Breakfast operating in the small South Coast town of uMzimkhulu. The uMzimkhulu area is known for its history of once being a border gate for the Transkei area, hence attracting a mixture of Zulu and Xhosa clans. The mixture of both clans resulted in a new and culture language called isiBhaca. Having grown in the area and understanding the Bhaca culture, owner Busisiwe Malanda has used this knowledge to her advantage to teach and expose this culture that is not recognised in many parts of the country- to her guests. Malanda offers her guests a feel of the Bhaca culture, food, music and traditions. The establishment has been running for seven years and Malanda says they offer great hospitality that caters for all and have a great history to teach her guests about the Bhaca Land and customs. Malanda said the incubation programme has helped her to market her B&B and she is busier than what it was. Malanda has expanded opening another operation – also a B&B in Margate. Sanele Cele is a newcomer to the hospitality sector having just established her bed and breakfast operation on the North Coast. The B&B is situated in a small village called Dukuduku towards St. Lucia. The establishment has 10 unsuited bedrooms, swimming pool, and offer activities with St. Lucia tour guides such as Theo Tours. The B&B offers a taste and feel of modern and traditional African hospitality. Her establishment has a restaurant that specialises in all foods across the world. Additional services include conferencing and event management. Cele says financial constraints for growing businesses like hers ais always a challenge but having platforms that TKZN offers to exhibit their businesses helps them to market themselves better, hence enabling them to create opportunities for others. “It is always good to lookout for our own people from the village because they also help a lot in terms of being hospitable when our visitors explore the area. We have very friendly people in the area that are always keen to educate our visitors about the history of the area and the beautiful village areas. As a way of helping each other we create new job opportunities for people in in the area,“ she said. If you are interested in adventure and wildlife, Xolani Theo Gina of Theo tours, has alot to offer. Gina has been in the tourism sector for more than 12 years and started his tour operating business in 2010 – taking advantage of the beautiful wildlife and sites that KZN has to offer. Theo tours offers educational, adventure, cultural tourism they offer for international tourists. They also offer bicycle tours around the Isimangaliso wetland park, which is one of the popular tours he specialises in. Theo works closely with Dutch and French travel agents who bring tourists to his company. Theo takes his guests on tours around the St Lucia area, Ismangaliso Wetland Park, Hluhluwe and Umfolozi Park. He also offers cultural tours for his international guests who are interested in experiencing authentic Zulu life in KZN. “In Theo tours we don’t only offer cultural tourism, we also offer school educational tours in Isimangaliso wetland park. We work with a lot of schools across the country and take them on excursion into wild territory sites. Gina has formed partnerships with some hospitality places such as Dukuduku B&B which is very close to them. This enables a good flow of relationships between tour operators and hospitality establishments. Lindiwe Ngcamu is the 37-year-old owner of Nongoma Siyavaya tours. The company offers a variety of packages that can include a tour of no less than six iconic Zulu palaces in the area. Nongoma is a town in KwaZulu-Natal rich in the Zulu culture and home to the Zulu monarch. The town was originally called Ndwandwane but this was changed by the local tribesmen to KwaNongoma (place of the diviner or mother of songs), as the land on where the town stands was considered sacred. Popular for being a home to the Zulu monarch, King Goodwill Zwelithini. His Majesty’s four royal palaces are scattered across the town. The palaces are one of Ngcamus’ strongest and most liked places to visit. Ngcamu takes her guests to visit royal palaces including the Khethomthandayo Royal Palace, Kwakhangelamankengane Royal Palace, Linduzulu Royal Palace and the Enyokeni Royal Palace. Ngcamu says she likes to give her guests an authentic Zulu kingdom feel. In her packages Ngcamu includes visits to the site of the annual Reed Dance, in Nongoma- where in early September, it becomes the site of the Umhlanga (Reed Dance) – a ceremony borrowed from Swaziland and adopted by King Zwelithini. Ngcamu says she also takes her guests to places like the Mona market where there are thousands of traditional healers and – when appropriate – a tour that includes ‘Unyazi’ or the Shembe. “Educating and taking my guests to these the places excites me because I get to share the beautiful history that we have in the area. We do not only limit ourselves on religious and cultural tours, but also cater for beach, cruises and so much more because KZN has a lot to offer,” she said. Thoko Jili is a 52-year-old passionate tour guide, from Wisdom Tours. Her travel agency is situated in the central business district of Durban. Jili considers her touring company to be unique because she has been around a lot longer than many other of her competitors. She provides guests with her own special historic and narrative of the places her guests visit and is very versatile in her approach. Jili enjoys taking her guests to the more rural areas where there are traditional Zulu villages, allowing guests the opportunity to sample traditional food and experience first-hand – an authentic Zulu experience. “I love KZN in such a way that I cannot advertise anything else. I think of myself as a KZN ambassador. The love and great response I get from my guests make my job even more meaningful. Most times after every tour, guests express their appreciation by giving me a small gift, an extra tip and by writing letters of appreciation,” she said. Lizeka Shandu is a 40-year-old tour operator from African Wild Travel. Shandu’s love for the industry has scored her a husband who is also a tour operator with international experience in the same industry, and this helped her to develop her business. Shandu is a co-owner of the African Wild Travel, travel company with her husband whom she met in Germany when the South African tourism in partnership with German government offered a one-year internship in the Western European country. Considering the romantic story of how travel brought her closer to her fate, Shandu’s travel management company offers and puts together leisure packages that are friendly for romantic holiday getaways, families and groups. Her husband’s international connections also boosts the profile of the business and they are able to score international guests. Shandu says she likes to go the extra mile for her guests, such as booking flights, creating family packages for groups and honeymooners. Her travel company allows for a lot of flexibility as her guests can choose what they want in their package. “My business is very much exposed to the sho’t left website, as 90% of my clients come from there. We focus 99% on giving our guests leisure. We don’t only focus on KZN, but we also offer national and international packages to my clients. We have international leisure packages such as giving our clients the Dubai experiences and more,” she said.